Anytime you use any sort of thyroid medication, it’s important to understand the possible side effects that they might cause. Oftentimes people are given the wrong kind of medication or prescribed the wrong dosage which can cause some pretty nerve wrecking thyroid medication side effects. So be sure to note any adverse reactions you might have and below I’ll discuss a few of the common types of thyroid medications and what kind of side effects you might experience and what they mean. And also keep mind that medication or supplements should only be used together with the right hypothyroidism diet or else your hypothyroidism treatment will not be effective in the long run. Believe it or not, T4 only medications are responsible for more thyroid medication side effects than the other forms of medication. And it is pretty apparent with how poor patients have been responding to these medications for years. These T4 thyroid medications oftentimes cause a buildup effect of T4 within the body. And as a result, this tells your body to stop producing so much thyroid hormone. So, your thyroid slows down even more. And you can quickly become more hypothyroid than when you started. The typical signs of this are when your symptoms begin to get worse or more frequent. So with that being said, the typical T4 only thyroid medication side effects can be any of the various hypothyroidism symptoms. T3 is the active form of thyroid hormone that can be used directly by your cells without requiring your liver to be involved. And because of this, it is possible to have some thyroid medication side effects from T3 only medications. If you introduce too much T3 to your body, your cells will absorb it and it can shift you from a hypothyroid state to a hyperthyroid state. This can increase your metabolism and raise your core temperature above its normal 98.6 Fahrenheit (37.0 Celsius). But it also makes you more susceptible to the effects of adrenaline. And this can lead to some uncomfortable thyroid medication side effects. These thyroid medication side effects should be taken seriously but are not permanent and will subside once your thyroid hormones normalize. And it’s all the more reason to manage your stress levels and keep your blood sugar balanced. Both of these issues will drive adrenaline high. 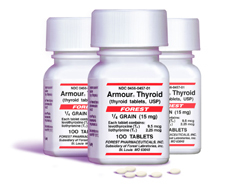 Combined T4 and T3 medication such as Armour Thyroid can also cause any of the thyroid medication side effects mentioned above. Because these medications contain predominantly T4, if your liver can’t convert the T4, then is can cause you to become even more hypothyroid and as a result, your hypothyroidism symptoms can actually get worse. But if your liver is converting the T4 then you can effectively take too much and produce too much T3 thyroid hormone. And this will result in the same symptoms mentioned above due to the increased sensitivity to adrenaline. Be sure to take look at the various Armour Thyroid side effects for more information. There’s a lot of talk of iodine deficiency and the use of iodine supplementation with hypothyroidism. And while iodine deficiency was a real issue at one point in time, it rarely is now in industrialized countries. Today the vast majority of goiters are the result of excessive estrogen which has a similar effect of not allowing the thyroid gland to release its thyroid hormones. But today, there are a lot of people recommending dangerously high levels of iodine without considering the negative side effects. For starters, it can actually have the opposite desired effect and further suppress your thyroid and cause thyroiditis. It can also contribute to the development of many degenerative diseases. But since it can suppress TSH levels then many people falsely believe that it is in fact working for them. Anytime you take medication, for your thyroid or not, it’s important to monitor your body’s response to that medication. If you notice any of the thyroid medication side effects listed above, it should not deter you from using it. But you should work with your healthcare provider to fine tune the dosage or to find a thyroid medication that is more appropriate to your body’s needs. One of the biggest problems with diagnosing hypothyroidism today is the unreliability of the testing that is used. Most doctors base their hypothyroidism diagnosis entirely on the levels of a single hormone called Thyroid Stimulating Hormone (TSH). But TSH alone does not provide enough evidence for a proper hypothyroidism diagnosis. And because this is primarily the only test that doctors use, the majority of hypothyroid people walk away undiagnosed. But it goes even deeper than that which I’m about explain. Below I’m going to talk about a couple of controversial topics regarding lab tests that are commonly used to make the hypothyroidism diagnosis and why they are useless. Then I’ll also cover the better options out there along with one of the easiest and most accurate ways that you can diagnose yourself. There’s no doubt about it. Hypothyroidism is by far the most under-diagnosed health problem today. And the biggest reason for this is the fact that the reference ranges used to diagnose are completely bogus. If you really want to get into the details of this, be sure to check out my free report, 7 Simple Solutions to Hypothyroidism, where I get into all of the details. But the reference ranges used today were based on the results of the old Protein Bound Iodine test that was once used as the hypothyroidism diagnosis gold standard. But since then, there has been plenty of research showing that this old test was a poor indicator of hypothyroidism at best. 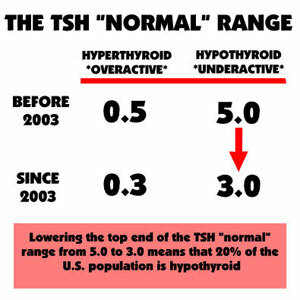 But aside from that catastrophic problem, TSH is still not a good indicator of hypothyroidism. And that’s because there’s plenty of other factors, independent of hypothyroidism that can effectively lower your TSH levels giving a false negative hypothyroidism diagnosis. The idea of measuring free T3 or free T4 is yet another very controversial topic. The free hormone theory was originally developed based on a limited understanding of the human cell. And research has clearly disproved this theory, even though some healthcare professionals continue to make their hypothyroidism diagnosis based on these results. When hormones enter your bloodstream, they are carried to different cells by what are called, transport proteins. And the free hormone theory was based on the idea that your hormones had to be “free” or detached from these transport proteins in order for these thyroid hormones to enter your cells and do their job. But research has clearly shown that these transport proteins can also enter your cells while carrying the hormones, which was once thought impossible. So when you account for only the “free” thyroid hormone in your bloodstream (5%) then you fail to account for the other 95% of the hormone that is still active. This means that free thyroid hormones are not a good indicator of hypothyroidism and should not be used as a basis for a hypothyroidism diagnosis. One beneficial way to look at hypothyroidism is to look at multiple indicators that collectively can provide a much better picture of how well your thyroid is working. For example, it’s well known that cholesterol is directly proportional to hypothyroidism. So, high cholesterol is one indicator. Hypothyroidism also results in the production of lactic acid so measuring the level of lactate in your blood can provide another useful indicator. Hypothyroidism also causes your body to lose sodium at an accelerated rate. So, low sodium levels are yet another indicator. When many of these indicators all point to the same problem then a hypothyroidism diagnosis can be made using an educated process. 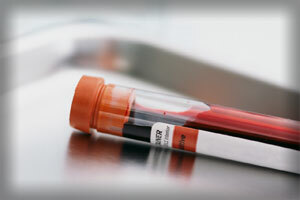 And one of the best things about blood testing like this is that it can also be used to help determine the best hypothyroidism treatment plan by giving you further insight as to what the underlying cause really is. Basal Metabolic Rate (BMR), when determined by lab equipment, used to be the gold standard back when doctors were confirming their hypothyroidism diagnosis with 40-45% of the population. Doctors would hook the patient up to a machine that would measure their oxygen consumption which was a clear indicator of thyroid function. When you’re hypothyroid, your body shifts aware from its health oxidative energy system which readily uses oxygen to other energy systems that are much less efficient at utilizing oxygen. The Achilles Reflex is a physical test for hypothyroidism that was used long ago along with BMR. But it is still quite valid and useful even today. One of the well known hypothyroidism symptoms is slowed nerve reflexes. So, you can easily test the reflex related to your Achilles tendon. With a healthy reflex, the muscle will relax immediately and the foot will quickly swing back to its resting position. But an unhealthy reflex where your foot slowly returns to its resting position is oftentimes used to support the hypothyroidism diagnosis. Monitoring your morning temperature was a concept that was pioneered by an American doctor by the name of Broda Barnes. And Broda Barnes found that your morning temperature which is determined by your metabolism could be strongly correlated with the health of your thyroid. A morning temperature of 97.8°F (36.5°C) or less is highly indicative of hypothyroidism. Of course, there are factors that can affect the accuracy of this measurement such as climate, stress hormones, etc. But it’s an easy test that you can do in the comfort of your own home which can be far more accurate than most lab tests. Respected endocrine physiologist, Dr. Raymond Peat, discovered that in warmer climates your morning temperature was not always the most accurate means of making a hypothyroidism diagnosis. You see, when the air temperature around you is warm, then your thyroid doesn’t have to do much work to maintain your core temperature of 98.6°F (37°C). And it doesn’t make sense to measure your thyroid’s capacity to work when it doesn’t have to work very hard to begin with. Dr. Peat also noticed a trend of very low pulse rates with those who suffered from hypothyroidism, even when their core temperatures were influenced by air temperature. But when these people took a thyroid supplement, their pulse rates returned to normal. So, by taking into account your morning temperature and pulse rate together, you get more accurate results than with morning temperature alone. According to Dr. Peat, the average resting heart rate of a healthy person is 85 beats per minute. And less healthy people average closer to 70 beats per minute which together with other indicators could be used to support the hypothyroidism diagnosis. Bear with me for a minute because this one is borderline crazy. In fact, it’s so crazy that doctors today don’t dare use it (please note the sarcasm). I’ve mentioned previously that long before every hypothyroidism diagnosis was made using the faulty lab testing used today, doctors use to confirm their diagnosis based on the concept of a therapeutic trial. Equipped with this novel idea, doctors would make the diagnosis based on their patient’s symptoms, multiple tests results, and their own clinical opinions. And they would treat their patient accordingly. But during the entire treatment, some of the indicators that were mentioned above, such as BMR, cholesterol, temperatures, and reflex rate were continuously monitored for improvement. If the patient’s hypothyroidism symptoms improved as these clinical indicators improved then the hypothyroidism diagnosis was confirmed. And this type of therapeutic trial can still be used today. If your hypothyroidism symptoms improve as your temperature and pulse begin to normalize then it’s safe to say that your self diagnosis is confirmed. Hopefully this has opened your eyes to some of the bigger problems associated with the sheer under-diagnosis of hypothyroidism today. And hopefully it has opened your eyes to some things that you can do to make your own hypothyroidism diagnosis and monitor your progress with the use of your own hypothyroidism diet and therapeutic trial.